Should Seattle Convert Public Golf Courses Into Land for Housing? Like many other metropolitan areas, Seattle is currently dealing with a serious housing shortage. Recently, there have been some good articles (here and here) about converting public golf courses into housing. It is an interesting concept and certainly should be discussed, however one aspect I feel is being overlooked in this debate is how popular are these golf courses anyways? According to Bloomberg News, there is declining interest in golf nationwide, is this happening in Seattle? The City of Seattle is somewhat aware of this issue and is at least discussing options for the golf courses. I filed a Public Records Request act with the City of Seattle and they sent me data on the rounds of golf played for the past three years. 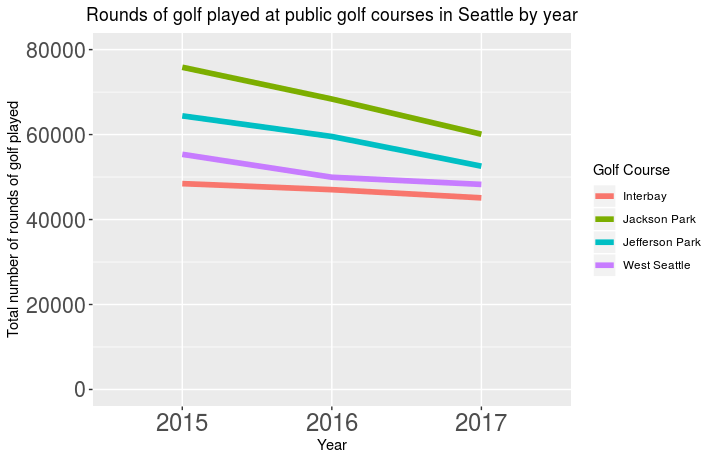 Unfortunately the city only provided the count data for number of rounds of golf played per year so I cannot look at more granular trends. However, I can plot the counts on an annual basis. It will be interesting to see if this debate both on converting public golf courses to housing goes anywhere both in Seattle and other major cities. I don’t have a horse in this particular race, I live near the Jefferson Park course and I really appreciate the large expanse of green it provides however I am acutely aware of the need for more housing within Seattle city limits. Interested in taking a look? I put the full data I got from the city here.